Antony and Cleopatra begins its run at the Dog Story Theater, 7 Jefferson SE, on August 10 at 8 p.m. Get tickets at www.dogstorytheater.com. 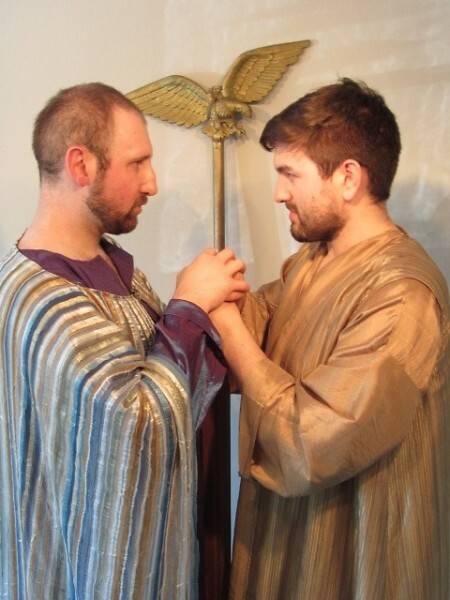 The West Michigan-based Pigeon Creek Shakespeare Company will present Shakespeare’s Antony and Cleopatra at the Dog Story Theater, Seven Steps Up, and Jenison Center for the Arts in August and September. This production is directed by Aili Huber, a guest director based in Virginia, who is returning to Pigeon Creek to direct her fifth production for the company. Antony and Cleopatra dramatizes the famous historical couple and their conflict with Octavius Caesar, who feels that Antony is neglecting his duty to Rome because of his relationship with Cleopatra. The play shifts tone from comedic to action-filled to tragic as Antony and Cleopatra’s romance plays out against the backdrop of historical events. Pigeon Creek’s production features actors Kaeleb Cogswell, Lauren Gibbard, Kimberlee Griggs, Kat Hermes, Emily Jacobus, Scott Lange, Katherine Mayberry, Ashley Normand, Sophia Powers, Riley Van Ess, and Seraphina Zorn. Fight direction is by John Scritchfield, with stage management by Jackie Frid. Pigeon Creek’s production will visit three different West Michigan venues, beginning with the Dog Story Theater in Grand Rapids. Audiences can expect an intimate experience of the play at all three venues, with seats surrounding the stage and a lively, audience-interactive performance atmosphere. More information about the Pigeon Creek Shakespeare company is available at www.pcshakespeare.com. Performance and ticket information for all performances is available below. Tickets range from $7-$16, and may vary by venue. August 10, 11, 17, and 18 at 8 p.m.
August 12 and 19 at 3 p.m.
September 7 at 7:30 p.m.
September 15 at 3 p.m.